I’ve been itching to make Chicken Cacciatore but sadly one key ingredient stood in the way. Green bell peppers and I just can’t seem to get along. Same goes for cucumbers. Two ingredients you’ll rarely see included in a recipe on Lemony Thyme. However, an Eat Out of the Fridge/Pantry produce drawer discovery changed everything. We had a Sprouts Farmers Market open last week half way between work and home. Pass it every day. Twice. I was certain of one thing, that on their grand opening day, the seafood and the produce were never going to be fresher. And so I went in. I wish I had taken a close-up picture of the peppers. All varieties looking so smooth and waxy. I chose two beautiful poblano peppers and a bag full of jalapenos. No plan for what to do with them, but they were the prettiest I had seen since our summer Farmers’ Market and they were coming home with me. Over the course of the week, those glorious peppers inched their way to the back of the veggie drawer faster than me in a workout class. It wasn’t until my weekend morning fridge cleaning that they were rediscovered, still looking fresh as can be. What to do with all of these peppers?! Pulled a pack of chicken thighs out of the freezer and we were on our way to Chicken Cacciatore, Southwest style. While green bell peppers don’t agree with me (please tell me I’m not alone here), I LOVE smoky fire roasted poblano peppers and have come to enjoy the moderate heat from jalapenos. They’re both green & peppers and replace green bell peppers in most of our recipes. 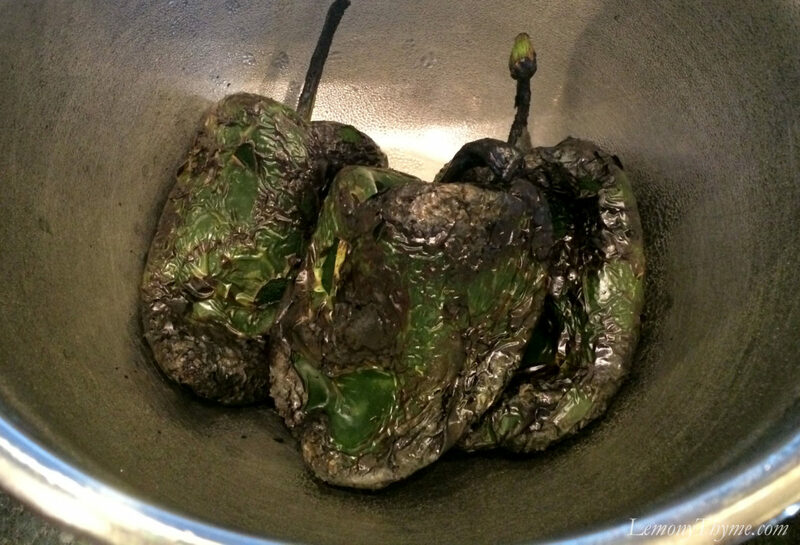 Recipe note: To remove the tough skin from the poblano peppers, simply char them, then let them steam in a covered bowl for a few minutes. I use my gas stove and lay the peppers across the burners, turning them with metal tongs. You can also use your gas grill or put them under the broiler. The key is to get them nice and black as shown in the picture above. Then put them in a bowl covered with plastic wrap until they are cool enough to handle. Run them under water and gently loosen the blackened skin. Most of it will just wash away. Cut a slit the length of the peppers to remove the seeds. Dice and add to your recipe. The series of photos above are my hope to encourage any hesitant cooks to enjoy our recipes. After a two to three hour braise you can see how rich and concentrated the tomato sauce becomes. While I envisioned Chicken Cacciatore as my next hearty comfort food dish, we were able to also enjoy it as a low-carb, calorie friendly meal. This dish served over spaghetti squash makes it a Healthy Choices meal. Don’t let the word healthy make you think boring. Those glorious peppers along with aromatics and seasonings delivered punch and personality…and the most delicious tender chicken. Season chicken thighs with salt & pepper. Heat oil in a heavy bottom pan. Brown chicken on all sides. Remove from pan. Drain off fat. Sauté onion and peppers until tender; about 10 minutes. Add in garlic and sauté for an additional minute. Deglaze pan with red wine, scrapping up any browned bits. Add plum and canned tomatoes with juice, chicken broth, and seasonings. Reduce heat to low, cover and simmer for 2 - 3 hours.